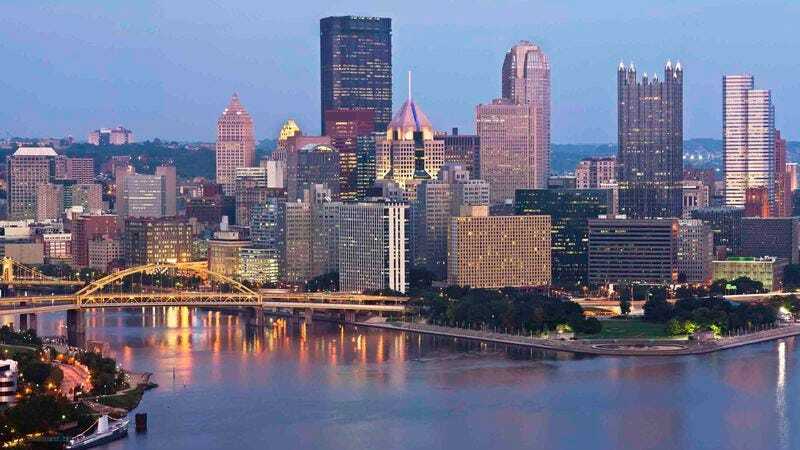 Is Pittsburgh The New Austin? The Austin We Hoped And Dreamed Of, The Austin That Was Foretold? Could it be? With low rents, a thriving arts scene, and old-school American authenticity, one city may be becoming the unexpected new home for a generation: Pittsburgh, PA. But is it truly the new Austin—the new Austin that was foretold to us? Do we dare dream it so? Up-and-coming millennials are among those hit hardest by the sluggish economy, and they’re looking for the next affordable, undiscovered city to settle in. Could their long quest be at its end? The historically rich steel-manufacturing town is home to over 40 colleges and universities brimming with young people, all with one shared dream: to be the next Austin. Not the Austin of old, but the one to come, promised to each other in shared dreams and secret whispers. Could it be possible that we have found the worthy successor to Austin? “But what of Portland?” one might ask. “What of Portland,” indeed. For years, tales of old claimed the Pacific Northwest city was the promised land—a new Eden upon this earth, where men and women would be free to think, and live, and love. A blossoming Eden teeming with hope and food trucks. But the old tales are clear reminders that the devil himself could not craft a trap so beautiful in its deceitfulness. And now, we ask, could our salvation lie in the City of Steel? It can. It must. From microbreweries, to vegan dining, to endless converted industrial living and studio spaces, Pittsburgh may finally give a lost generation of wanderers a city to call home.